As we looked down at the stone pavement I was aware of many things – these stones had been reused in 135 AD only 100 years after the time of Christ; that etched into one flagstone was the outline of a dice-game played by the Roman Soldiers, known as the “King’s Game”, and occasionally, the soldier who won it was given the robe of the prisoner to be crucified; that there were strong grounds for believing that Jesus may have walked on some of these stones. 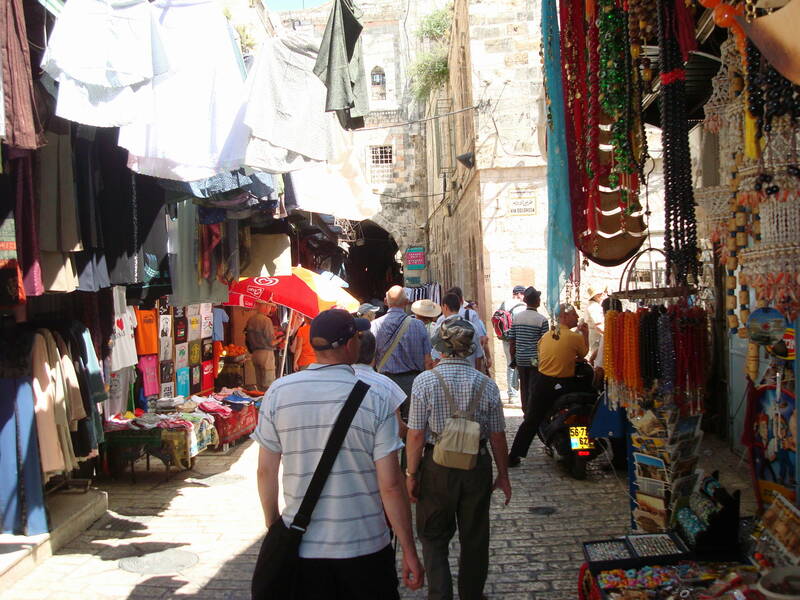 We then began our journey on the Via Dolorosa or “Way of Sorrow” which winds along the narrow streets of Jerusalem’s Old City, and leads from the Ecce Homo Convent to the Church of the Holy Sepulchre. This is the traditional route Jesus followed bearing His cross from Pilate’s Judgement Hall in Antonia, to Golgotha, the site of the crucifixion. Along this route are the “Fourteen Stations of the Cross”. Each station marks an event of something that happened en route, with chapels for reflection, convents and monasteries of devotion, and the Basilica for commemoration. As we walk along in the middle of the afternoon we were aware that it was not practical to stop for devotions at certain places; the area is a mass of people and shops. And while some were disappointed, I was not. This was how it would have been for Christ – people everywhere, trying to make his way through the crowd, people looking at what was happening, noise, and the bustle of everyday living in the midst of impending death. And I thought of my own Father and the many like him who have looked at the bustle of everyday living going on around them as they have faced their impending death. Then suddenly at station VII in an area surrounded by market stalls we were ushered through a door – to our right were some steps down to a chapel, to our left, stairs up to the chapel above. This station, we were told marked the western boundary of the city in Jesus’ time, and was the sight of the Judgement Gate. It was from here Jesus would have carried his cross outside the city walls to the place of the skull (Golgotha). (Sometimes you need to be reminded that the city walls of Jesus’ day are not the city walls that surround the city today). We moved on, following the route, ending up at the Church of the Holy Sepulchre which contains the last five Stations of the Cross. This great Basilica encompasses all the remains of the traditional rock of Calvary and the site of the tomb. It was amazing to think not only of what Christ endured that day, but also that we were walking the path countless millions of pilgrims have trod over the centuries. All of us connected not only by the story, but by the fact that we are part of the body of Christ.